Pupil safety in schools is at an all-time high, but despite the efforts, many schools are failing to put in place measures that protect students from an everyday danger – the air we breathe. Children spend hundreds of hours in school every year, so the indoor air quality (IAQ) of their classrooms must be considered an important part of health and safety. The reality is, however, that many schools consistently overlook IAQ and its impact onstudents. Research shows that poor IAQ has temporary and long-term effects, on both student health and academic performance. In the short-term, exposure to indoor air pollutants every day at school can lead to temporary health issues like eye, nose and throat irritation; fatigue; and headaches, or to more serious health problems, like asthma. Regular exposure to some contaminants has also been found to cause serious long-term health problems, including cancer and damage to the liver, kidneys, and respiratory and nervous systems, among others. So, how can we ensure the learning environment is a comfortable and productive one? Various studies have shown that indoor air pollution has increased in recent years. This is due to a variety of factors, including the construction of tightly sealed buildings, the reduction of ventilation rates to save energy and the use of synthetic building materials and furnishings. Furthermore, the use of chemically formulated personal products and cleaning supplies has added to the problem. Schools and colleges, alongside other educational buildings are now at increased risk of IAQ issues, such as the build-up of CO2 in the classroom, the result of which can impact concentration, productivity and attention span. The University of Reading has established a link between the classroom environment and pupils’ cognitive performance, with air quality conditions in 35 per cent of classroom hours found to be inadequate. Pupils and teachers were found to have been exposed to CO2 concentrations of up to 3.5 times the government recommended average levels of 1500 ppm. When weather conditions are not conducive to natural ventilation, mechanical ventilation becomes a much more reliable option. If working effectively, heating, ventilation and airconditioning (HVAC) systems can significantly boost a school’s IAQ by keeping the temperature, humidity and air pollutants at safe and comfortable levels. However, if the HVAC system is outdated or not working properly, the quality of indoor air can quickly deteriorate. 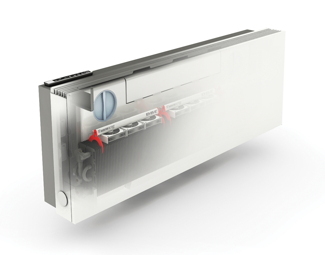 The latest demand controlled ventilation (DCV) solutions work by regulating the intake of air into a classroom based on the changing levels of CO2 in the environment, extracting stale air at the same rate. Bringing in outside air before filtering it delivers consistent circulation throughout the space, no matter what changes occur in the classroom throughout the day. 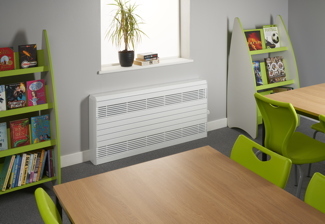 What is particularly smart about DCV systems is that at times during a school day where levels of CO2 could become incredibly high due to highoccupancy of people in an exam hall, PE spaces or being in a space for a long period of time, for example, the system kicks in and ensures that the IAQ remains at the optimum level. In addition to controlling CO2 levels, a well-designed ventilation system can also help control warm, summertime temperatures by utilising secure night-time purge ventilation. This lowers the temperature within the space when external temperatures are lower. Because fresh air is only vented at the time and rate it is required, DCV can be as much as 23% more efficient than fixed rate ventilation practices, such as opening windows or constant volume ventilation units. This can provide school managers with significant energy savings, at a time when local authorities are under pressure to cut budgets. A recent survey of teachers has found that pupils are increasingly being taught in damp, cold classrooms in schools that are rapidly running out of space. A majority of teachers (77%) said the temperature in their classroom was not comfortable all year round, and almost three in five have witnessed a physical deterioration of occupants in the school building they work in. It is estimated that the equivalent of 24,287 classrooms - or 2,122 new schools - must be built before 2020 to meet the growing numbers of primary and secondary school pupils. Local authorities are estimating there will be an additional 729,000 primary and secondary school pupils by 2020 and the rise in pupil numbers will require many more schools to be built across the country. With billions of new investment expected over the coming years, there is an opportunity to directly address the issue of indoor air quality by future-proofing an entire generation of schools. Specifiers have an important role to play by recommending solutions that can really make a difference. Deploying DCV, in conjunction with a highly efficient mechanical ventilation system can help schools exceed the recommended standards and ensure that children have an optimal environment in which to make the most of their education.